Very soothing to the gut, and DGL Powder by Vital Nutrients has a nice pleasant taste. I have severe acid reflex (Gerd). A doctor recommended DGL Powder. I was surprised at the relief it gives me. 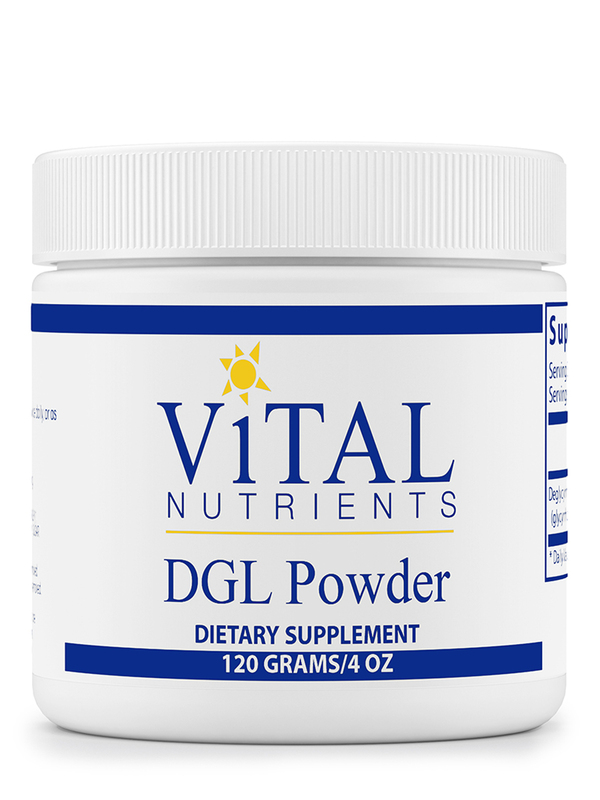 I have used DGL Pwder by Vital Nutrients for many years for my digestive issues. It is a great product and works quite well. If you frequently experience stomach aches‚ heartburn‚ acid reflux‚ or inflammation in the lining of your stomach‚ you may benefit from taking licorice root to relieve your symptoms. Unlike many over-the-counter treatments for these conditions‚ licorice root may actually impact the cause of the problem‚ rather than just mask it. Licorice may help with these symptoms by providing the nutrients your digestive system needs to function properly‚ by encouraging your stomach and intestines to produce the mucous that aids in healthy digestion‚ and by encouraging the healing of the stomach and intestinal lining. Unfortunately‚ it’s difficult to eat enough licorice to obtain therapeutic benefits; it’s relatively high in calories and low in nutrients. In addition‚ licorice root contains a substance called glycyrrhizin that may cause uncomfortable side effects like bloating and water retention. 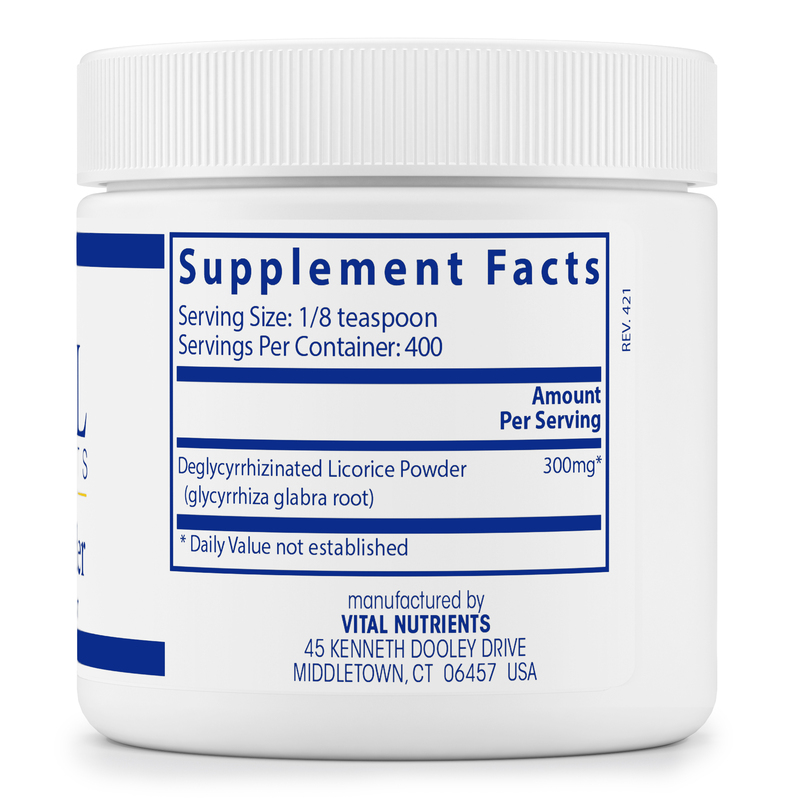 Vital Nutrients’ DGL Powder contains deglycyrrhizinated licorice root‚ meaning that the glycyrrhizin has been removed. The active ingredient of this powdered supplement which may promote digestive health. It may also relieve stomach aches‚ heartburn‚ acid reflux‚ and gastritis. Vital Nutrients cares about the safety of its consumers by taking extra steps to ensure products comply with several criteria. This supplement has been independently tested for authenticity‚ heavy metals‚ herbicide and pesticide residue‚ stability and bacteria‚ yeast and mold counts‚ solvent residue‚ aflatoxins‚ and potency. This supplement does not contain and preservatives‚ coatings‚ binders‚ or artificial flavoring or coloring. 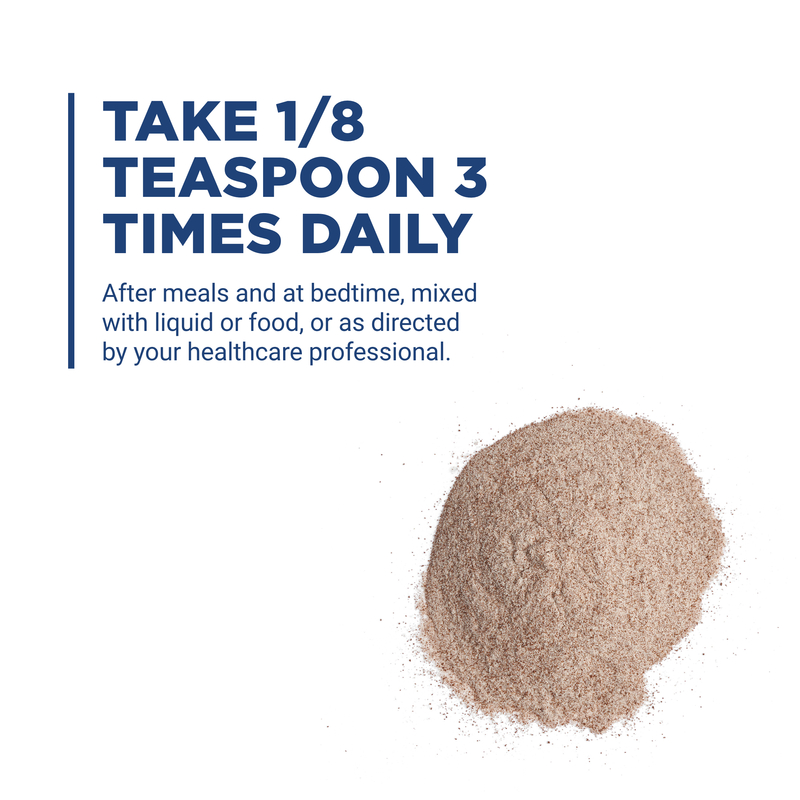 Take one-eighth teaspoon of DGL Powder by Vital Nutrients three times a day‚ between meals and when you go to bed. If your symptoms remain or get worse‚ see your doctor. Also ask your health care provider before taking this supplement if you're pregnant or nursing. 1/8 teaspoon 3 times daily after meals and at bedtime‚ mixed with liquid or food‚ or as directed by your healthcare practitioner. Notice: Inner seal may lift off when cap is removed. Seal integrity is maintained until cap is removed. I drink some DGL Powder by Vital Nutrients with water and it makes me feel tired and weird, don't know how to explain it but its some weird reaction. I read on the internet that Licorice lowers dopamine levels. I took DGL Powder by Vital Nutrients for like a month and was feeling very depressed without motivation. It is pure DGL powder, no fillers or crap like in the chewable tablets, and you can just throw this in your protein shake/smoothie. Good price from PF and love free shipping !! I was taking DGL Powder by Vital Nutrients for adrenal issues. It is a good product, but I did not notice a big difference. Great DGL with no junk! DGL Powder by Vital Nutrients has been very helpful in calming my upper gut when soreness is out of hand. Helps with my GERD symptoms. A lot of value in the powder since the dose is small. My doctor recommended as part of my ulcer healing protocol. As far as I know, this is the only DGL out there with no additives that you can sort of chew and swallow, which is what is usually recommended. Have purchased this several times and will continue for as long as necessary. No fillers or additives.... Just plain DGL. Nothing, aside from the fact that powder is not handy for "on the go" but I get by with a tablet form for those moments, although I hate the additives in them. Excellent product for bacterial issues, especially in the gums and mouth. I add it to my Ultrameal shake for a natural sweetner. This product helped me control my infections and stomach issues. I was encouraged to try this product with a couple other ingredients to address my leaky gut syndrome. My naturopathic provider was charging me a fortune. Needless to say see recommended your product as the most reliable and she wasn’t wrong. I have been very satisfied with your products as well as your prompt mode of delivery. I have Gerd .. wanted to know for howl long should I purchased DGL powder from your wed site. for how long should I take the product? is it safe if I take it more than 6 weeks? Hi , Thank You for your inquiry. We highly recommend getting in contact with your health care practitioner for the most accurate information. Have a Great day! 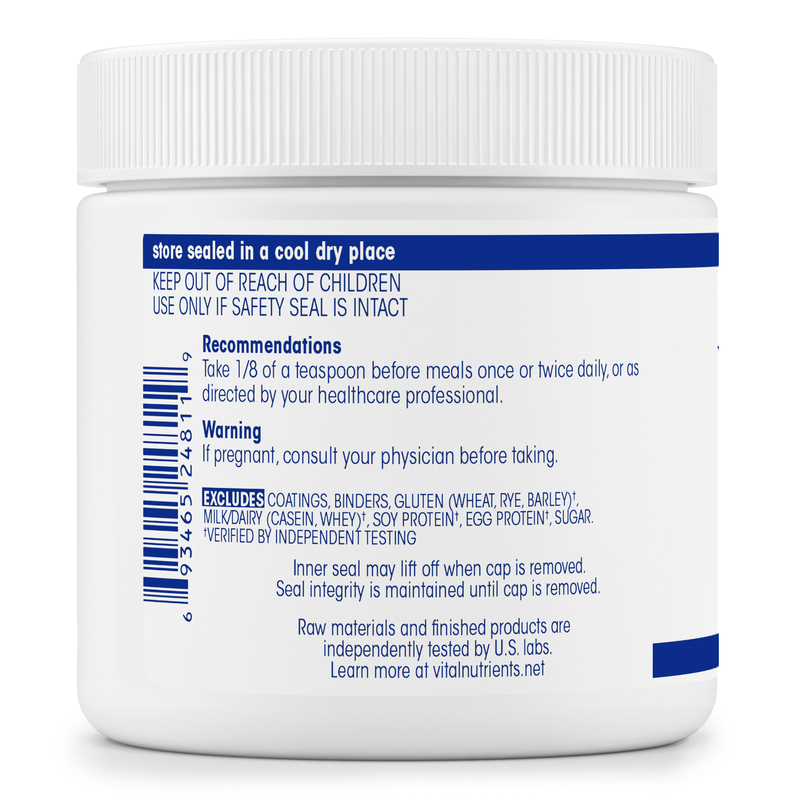 I want to order the Vital Nutrients DBL product but have two imporant questions- (1) Doctor recommends taking this powder before the meal while the description on this label says take after the meal. Which way is best? Or does it matter?? (2) How best to take this powder. By itself , water or in a shake? Thanks for any assistance. Hi there! Christine, to answer both your questions, if your doctor recommends you to take before a meal then it is best to take it before a meal and he will also be the one to recommend how to take this powder for he is more familiar with your needs and would be able to make a recommendation that is the best for you.